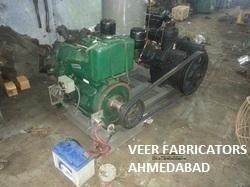 Leading OEM Manufacturer of diesel engine compressor, vertical type air compressor and engine driven air compressor from Ahmedabad. 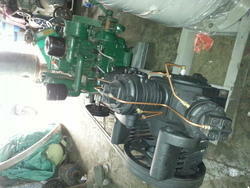 Banking on our immense experience and knowledge base, we are manufacturing and supplying Diesel Engine Compressor. The offered air compressor is compact in size, leak proof and fuel efficient. It is used in various industries including automobile, electrical, food processing and pharmaceutical. This air compressor offers hassle-free operations over a long period of time. These Vertical Package Is Completely Self Oriented Compressed Air Plant Engineered Into An Unusally Compact Unit That HAs Everything You Need To Generate Low Cost High Volume Air. The Lubrication Is Done By Oil Pump Which Works As Soon As The Air Compressor Starts & Oil Is Used For Frame Lubrication Only. A Separate Cylinder Lubricator Reservoir Is Provided On Lubricated Air Compressors. Non Lubricated Oil Free Air Compressors Are Supplied With Teflon Parts That Require No Oil. These Air Compressors Are Used In Industries Where Big Volume Of Air Is Required. We are among the veterans in the industry for manufacturing and supplying Engine Driven Air Compressor. The offered air compressor is fabricated from high grade materials sourced from an authentic vendor base and is durable. It is ideal for heavy duty usage, robust in terms of construction, resistant to corrosion, tolerant to high pressure environment and seamless in terms of finish. Looking for Engine Driven Air Compressor ?